Back to the… rat race? 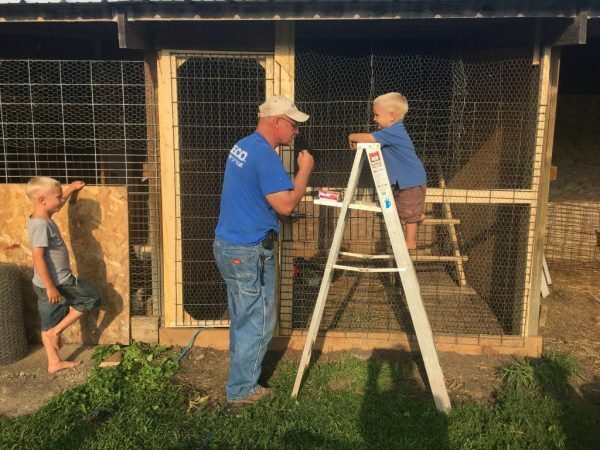 Stellan had a supervisory role in the building of Dad’s chicken coop. 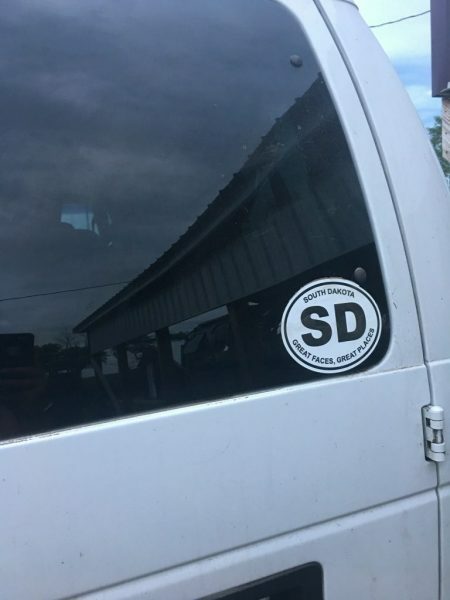 I bought myself a new sticker for my van. I rather love it. And I had to drive all over town and stopped at three stores before I finally found a South Dakota sticker. South Dakotans don’t care to spread the news. They are out to keep their quiet state quiet. And then I loaded up my van, packed up the horse trailer we bought up there, and headed south again. Bittersweet. We made it 650 miles in 11.5 hours. Not the best time we’ve ever made but given the sixteen foot trailer I towed full of a ton of grain… it wasn’t awful. We bought rolled corn up there because… it’s cheaper. It also made stopping my van a much more interesting venture. We also brought home seventeen chickens. Stops looked something like this: “You take littles potty. You check and water chickens. You let the dog go potty. I’ll pump gas. Check tires. Switch potty breakers. 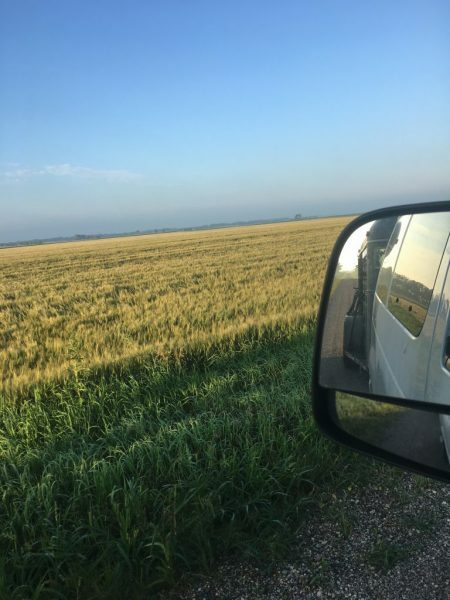 Now… pile back in and we go again.” We very nearly found ourselves chasing a chicken around a truck stop parking lot in Iowa. She was not impressed with her travel arrangements, apparently. All week and escalating over the weekend, several of the kids had been fighting what I thought was infected bug bites, then ringworm. It. Wasn’t. By Monday on the drive home, I decided it was time for more that the over the counter meds I’d been throwing at it. I made an appointment with the pediatrician for Tuesday. Tuesday morning the ped’s office called and moved the appointment to Wednesday with the nurse practitioner instead. Co-op meetings were Tuesday, the two oldest girls were working for a neighbor picking elderberries… it was a packed day. Tuesday night I went to bathe and reapply anti fungal to Elliot and found her wounds exponentially worse. And so. I loaded up the six kids with sores and we went off to the emergency room. This was a new experience for me in my parenting career. I can officially say I am not impressed. I’ll find my hole and hibernate once more. They didn’t know what was wrong. Threw out the idea of MRSA. Prescribed a stronger antifungal without having a clue why my children have chunks of skin missing. We saw the nurse practitioner at the pediatrician’s office this morning. You know, after getting home from the ER at 12:30am, the girls going back to the neighbor’s at 7am, and everyone getting about five hours of sleep. The nurse practitioner immediately diagnosed impetigo. Was dumbfounded that the ER didn’t figure this out. Prescribed more meds. And so we begin the process of trying to regrow skin. I’ve never seen anything like this. 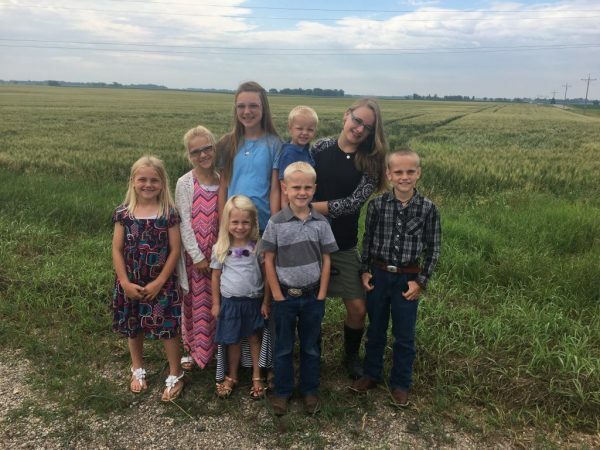 The kids said on the way to the ER that they were afraid they all had cancer. Poor children. I learned a few things in all this. First, trust my instinct. Second, taking six children into the ER makes for a buzz and spectacle like nothing I’ve experienced in all my years of going places with many children. Third, I cannot forget my tea in the morning. I forgot it one morning in all the chaos, and walked away from it this morning in an attempt to get out of the house without my biggest helpers, and the headache is profound and relentless. Tomorrow we stay home. Beautiful, beautiful words. Such beautiful country in your photos. Love the wide open, but then it is home 😊. We miss you before your even gone but the lack of croquet wickets and the trampoline and bicycles no longer littering our yard is depressing to see. We so enjoy your visits. Just wish we lived closer. Oh my goodness, I can’t imagine pulling a trailer 650 miles. You are a tough one. Plus the corn and the chickens. You must have nerves of still lady. Haha!! I sure hate you had so many with skin issues. What would cause that? I have heard it is contagious but don’t know anything about it. Cute pictures!! Thank the LORD you all made it home safely. We don’t really know. It might have started as bug bites. I suspect Sterling’s started as poison ivy. But the bacteria enters any open skin and spreads, I think. The word alone is awful. Impetigo. Never heard of it, I’ll have to do a Google search. Thank goodness for boring days, indeed. Hopefully everyone heals quickly.